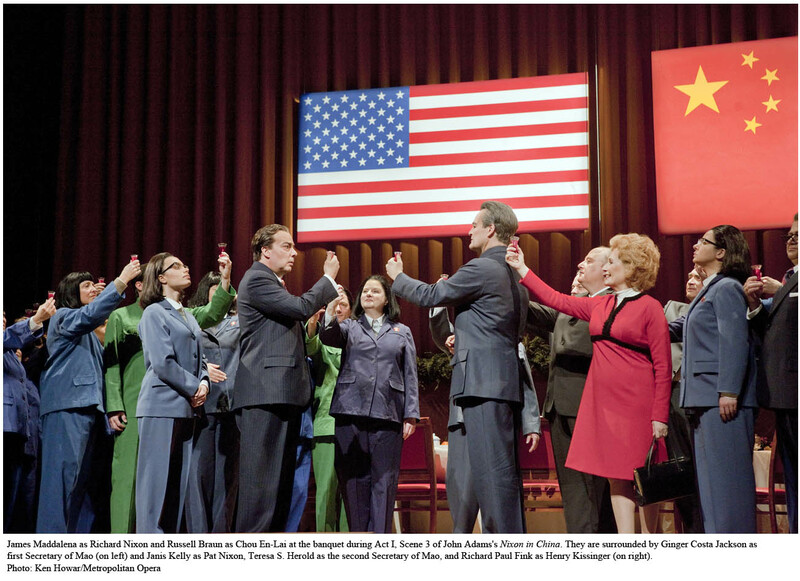 I wasn't sure what to expect from Nixon in China, as most of the press coverage I had read beforehand focused on the opera as event. An event it certainly was; I thought it was also a fascinating opera. I came out haunted by the music, humming the music, and with lots of thoughts to mull. From an edgy opening chorus backed by ominously propulsive music to the ambiguous, elegiac conclusion, via dizzying ensembles and interchanges, a complex drama was kept taut through Adams' characteristically inventive orchestration and a fascinating libretto. In a way, I feel as though my identity as a historian (in training) makes my positive reaction to Nixon in China almost inevitable. (For me, the events of the opera fell just on the far side of the artificial division between history and current events, and I learned about them from the glossy pages of textbooks instead of those of magazines. But I heard murmurs from the older opera-goers next to me: "Oh, there's Pat! Look, it's Kissinger!") Adams, Goodman, and Sellars all gleefully threw themselves into the exploration of how history is consciously and unconsciously constructed by its participants, which I adored. The uncanny/uncomfortable familiarity of twentieth-century (American) political image-making got laughter of acknowledgment from the audience more than once. The music both enabled the characters to express themselves and commented on their actions. Adams, unsurprisingly but gratifyingly, led the Met orchestra with great spirit and verve, and commendable sensitivity to the singers. (He has a great blog post on preparing the Met production here.) I feel repetitive gushing about the Met chorus, but they were fantastic, attacking the music with fearless precision and contributing hugely to the atmosphere. There was impressive participation from ballet artists, too; see, for example, "Flesh Rebels." The singers all acquitted themselves well, I thought, including the wonderfully unsettling Three Ladies, er, I mean Mao's secretaries, sung by Ginger Costa Jackson, Teresa S. Herold, and Tamara Mumford. I don't think I was the only one thinking of Verdi's Grand Inquisitor when they escorted the tottering dictator into the room on his first entrance. Robert Brubaker sounded occasionally pinched as Mao, but also produced moments of unexpected sweetness. Richard Paul Fink brought plenty of bold bluster to Kissinger, but was also committed to the character's revelations of cautious pragmatism, and even a confession of lost power in the conference with Mao. Russell Braun's Chou En-Lai sang with admirable restraint and elegant lyricism. I'd love to see him as some of the Italian rep's morally conflicted baritones. There was more clever play with vocal characterization in the main women's roles. Kathleen Kim's excellent Chiang Ch'ing exploded from dowdy background figure into strong-willed, power-obsessed vocal fireworks in "I am the wife of Mao Tse Tung" but also spun lines of melancholy sensuality in the final scene. Fred Plotkin once described the fach of the lyric soprano as being "the world's girlfriend," and Janice Kelly's Pat Nixon seemed poignantly conscious of this expected role, and determined not to let this become a tragic consciousness. Forced to enact a subservient, if not entirely passive role, she is determined both to do her duty and to obey her conscience. Kelly both sang with great sweetness and acted with great sympathy and subtlety. Also, this makes two strong and complex female characters in the same opera, for which I would like to give Mr. Adams a great big bravo, and brava to librettist Goodman as well. James Maddalena's warm baritone, as has been widely observed, is noticeably worn. However, to judge by reviews, he was in better vocal health when I heard him on Tuesday than in some previous performances. Furthermore, as can hardly be overemphasized, he inhabits the role as if he's far more comfortable with it than his complex Nixon ever is inside his own skin. Self-absorbed, self-important, self-doubting, anxiously trying to shape the future (and the past,) his tortured, tragic humanity was profoundly moving. James Levine, Lord love him, spoke in today's Met press conference about the importance of keeping new works in the repertoire, not just putting them on as a polite gesture. I certainly hope that holds true for this richly rewarding piece.